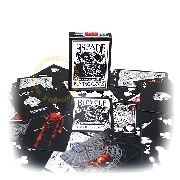 WHAT IS THIS DECK The Bicycle Black Tiger Gaff Deck is a full collection of special art cards designed to fit secretly with your normal Tiger deck. No spectator expects cards like these. This allows you to perform amazing illusions that were never thought possible.